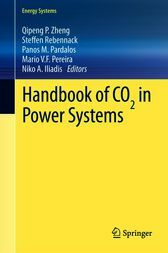 The Handbook of CO₂in Power Systems' objective is to include the state-of-the-art developments that occurred in power systems taking CO₂emission into account. The book includes power systems operation modeling with CO₂emissions considerations, CO₂market mechanism modeling, CO₂regulation policy modeling, carbon price forecasting, and carbon capture modeling. For each of the subjects, at least one article authored by a world specialist on the specific domain is included. Qipeng Phil Zheng is an Assistant Professor at the West Virginia University. Steffen Rebennack is an Assistant Professor at the Colorado School of Mines. Panos Pardalos is a Distinguished Professor at the University of Florida. He is also the Director of the Center of Applied Optimization and affiliated with the National Research University Higher School of Economics in Russia. Niko A. Iliadis works with EnerCoRD - Energy Consulting, Research and Development in Athens, Greece. Mario V. F. Pereira works with Power System Research in Rio de Janeiro, Brasil.